KDM6A/KDM6B Activity Quantification Assay Kit (Fluorometric) (ab156911) is a complete set of optimized reagents, designed for measuring activity/inhibition of KDM6A and KDM6B using nuclear extracts or purified enzymes from a broad range of species such as mammals, plants, fungi, and bacteria, in a variety of forms including, but not limited to cultured cells and fresh and frozen tissues. There are currently a limited number of methods used for detecting KDM6A/KDM6B activity/inhibition. The traditional method is based on the measurement of formaldehyde release, a by-product of KDM6A/KDM6B enzymatic reaction, and has significant weaknesses: (1) large amounts (at µg level) of substrate and enzyme are required; (2) nuclear extracts from cell/tissues cannot be used; (3) redox-sensitive KDM6A/KDM6B inhibitiors are not suitable for testing with such methods; (4) high intereference by SDS, DMSO, thiol-containing chemicals, and ions, which are often contained in enzyme solutions, tested compound solvents, and assay buffers; and (5) less accurate than direct measurement of KDM6A/KDM6B-converted demethylated products. Lysine specific demethylase 6A (KDM6A/UTX) and lysine specific demethylase 6B (KDM6B/JMJD3) demethylase lysine 27 on histone H3, thereby playing a central role in histone code. KDM6A and KDM6B are JmjC (Jumonji)-domain-containing proteins and catalyze the removal of di- and tri-methylation from histone H3-K27 by using a hydroxylation reaction with iron and alpha-glutarate as cofactors. Histone demethylase that specifically demethylates 'Lys-27' of histone H3, thereby playing a central role in histone code. Demethylates trimethylated and dimethylated H3 'Lys-27'. Plays a central role in regulation of posterior development, by regulating HOX gene expression. 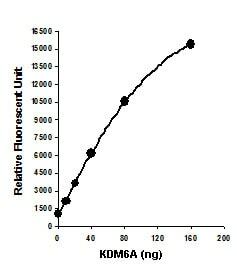 Demonstration of high sensitivity of KDM6A/KDM6B activity assay achieved by using KDM6A recombinant protein with the KDM6A/KDM6B Activity Quantification Assay Kit (Fluorometric). ab156911 has not yet been referenced specifically in any publications. Publishing research using ab156911? Please let us know so that we can cite the reference in this datasheet. There are currently no Customer reviews or Questions for ab156911.